Home » Rustic Fence Blog » Should I Stain, Paint or Varnish My Wood Fence? Should I Stain, Paint or Varnish My Wood Fence? Whether you have a new fence or need to maintain an old wooden fence, you have several finishes to choose from including stain, paint or varnish. Since these are vertical surfaces, you don’t have to worry about paint chipping from harsh weather as it would on flat surfaces. Thus, you may choose the medium you want for your wood fence based on your landscaping. Before you choose the medium for your fence, determine how often you want to maintain the fence. All mediums wear out after time. Paint will fade, peel and chip. Stain will also fade but doesn’t have to be scraped off. Also, wood soaks up stain and varnish more than paint. Thus, it protects the wood for a longer period of time. Stain is less expensive than paint; however, you need more of it to ensure that you have enough on the fence to protect it. With paint, you’ll need to repaint a wooden fence more often than if you stain the fence. Paint, stain, and varnish will protect the fence from bugs and from rotting too fast as long as you keep up the maintenance. While paint does soak into the wood, not as much soaks in as if you were to use stain. More of the paint lies on top of the wood, thus you’ll have to paint the fence more often than if you were to stain it. However, you have more colors to choose from. Paint goes on thick, so you could get away with one coat if you put it on thick enough on the first coat. Stain soaks into the wood, so you’ll need more of it for the initial application on raw wood. You also have several colors of stain to choose from, though not as many choices as paint would give you. 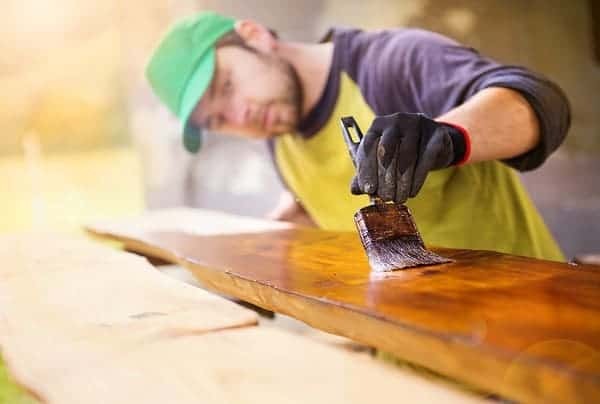 Stains are usually based on the different colors of wood, such as mahogany, red oak, oak, and maple. Let each coat of stain dry before applying the next coat. The more stain you put on the fence, the more protection you will have. Use an all natural brush or a cotton rag to apply the stain. You are able to use more coats if you apply the stain with a rag since it applies less stain than a brush. Generally, you would use varnish for a top coat. However, because varnish is very durable due to the higher ratio of solids, you could use it as the protective medium. Varnish should be applied using a natural bristle brush instead of a nylon brush. For outside projects, use Spar varnish. This is the type that is recommended for use on boats and decks, so it has lasting power. When it’s time to replace an existing fence or if you are ready to put up a new fence, contact Rustic Fence. We’ll help you choose the fence that is perfect for your landscaping or privacy fence needs.